A young man in the Northern Regional capital of Tamale is expressing fear and concerns about how the municipality of Tamale is becoming scarier. This, he has attributed to the alarming rate at which the youth waste their lives on hard drugs and other related drug substances that endanger their health and society at large. FK Farouk told Bole based Nkilgi FM, these guys who are into this illegal trade now have the courage to advertise and trade in these drugs in various suburbs of Tamale especially his neighborhood. 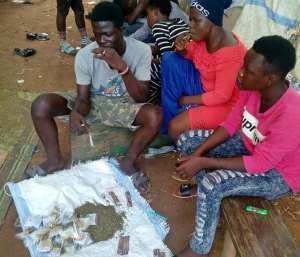 Mr. Farouk added that some homes in Tamale now provide those engaged in this illegal business with their customers who are mostly infants especially girls below the ages of 10 openly abusing these drugs whilst the society looks on without any say. Mr. Farouk, a student of the University for Professional Studies ( UPS) further quizzes the whereabouts of the religious morals and values that were once upon a time the guiding principle used to nurture every young growing person who hails especially from this part of Ghana? He went further to ask whether we are proud as a people about how the supposed leaders of tomorrow are being groomed and whether the society will be safe in the future having these people lead us tomorrow. In the past, these illegality used to be done under the cover of secrecy, darkness and far away in the bushes mostly known as ghettos. Many are therefore surprised about how it is eventually becoming legal even in some homes people go into these businesses without being apprehended by the law enforcement agencies. He told Nkilgi Fm tramadol abuse has become the order of the day with the youth much involved in the practice. Wee smoking, alcohol and the intake of other hard drugs is rampant these days in the society. It is therefore not surprising seeing most of our future leaders at very youthful ages walking naked on the streets as madmen and women. Nkilgi FM wish to urge parents, civil society, religious leaders, the media to strengthen the campaign against the sale and use of these deadly substances since it is retrogressing the rate of development especially in this part of the country. The practice is not limited to a particular location but spread across the entire country.